The Collegiate Church of St. Nicholas is the largest medieval parish church in Ireland in continuous use as a place of worship and is at the heart of Galway’s life. A tour through the church will allow you to glimpse part of its rich history. You will see signs of the iconoclasm of the soldiers of Oliver Cromwell. But, by contrast, should you visit during one of the many acts of worship you will see and hear the present-day richness of the liturgy where sound and colour fill the delightful medieval building. Perhaps such liturgies are not that far removed from the sights, sounds and smells that graced St Nicholas centuries ago. 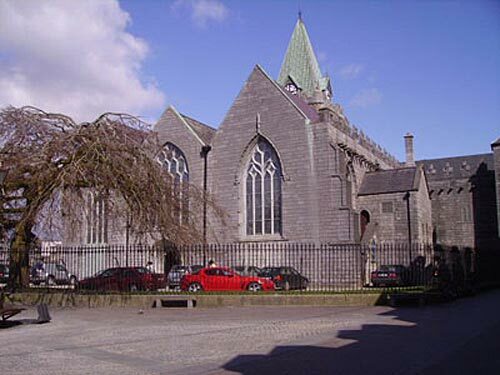 We invite you to come on a tour: St. Nicholas’ Church is old and big and beautiful, and sits right in the middle of the medieval centre of Galway city. It is dedicated to St Nicholas of Myra, patron saint of children (Santa Claus) and of mariners. There is some disagreement about when it was built, but it was certainly finished by 1320. 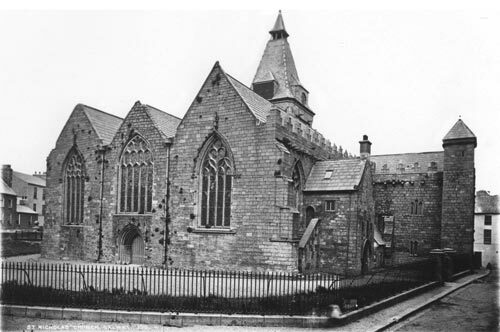 When the church was built Galway was a tiny, very new town, a sort of frontier settlement in the wild west of Ireland. The inhabitants, however, thought a lot of themselves and had big ambitions. They built a huge church, bigger than many Irish cathedrals. During the 16th century, when the famous 14 Tribes were at the zenith of their power, the church was extended by two of the most powerful families the ffrenches and the Lynchs, each of whom built a new side aisle to the nave, resulting in an almost square interior and the unusual three-roofed profile. There are many interesting and entertaining monuments and memorials in the church. Look out for Galway’s Jane Eyre, a virtuous and pious parishioner, who in 1760 bequeathed £300 to the corporation to give bread to 36 ‘poor objects’ for ever. What happened to the £300 is unknown. Or spare a tear for little James Kearney who played with his spinning top in the street and was run over by a horse and cart. The baptismal font is over 400 years old and the dog carved into its side still keeps an eye on Galway’s newest citizens as they are baptised. The oldest inhabitant of the church is Adam Bures, whose grave marker dates from the 13th century and is fondly known as the Crusader. High above the north aisle is perched the Lepers’ Gallery which gives access to the Belfry. The name is inaccurate – Galway Corporation firmly banned any sufferers from the disease from entering the city. On the outside of the church one can see two mermaids, a dragon, an ape and a magnificent lion. High at the roof edge are a series of stone gargoyles, some of them richly carved into horses heads, a manticora, human heads and another lion. Amongst the visitors to St Nicholas’ over the centuries the most famous is probably Christopher Columbus, who likely prayed here during a visit to Galway in 1477. Less welcome were the Cromwellian troops who used the church as a stable for their horses after the siege of Galway in 1652. They are blamed for the headless and handless state of most of the carved figures inside the church. The church is open all day, every day, and visitors are most welcome! 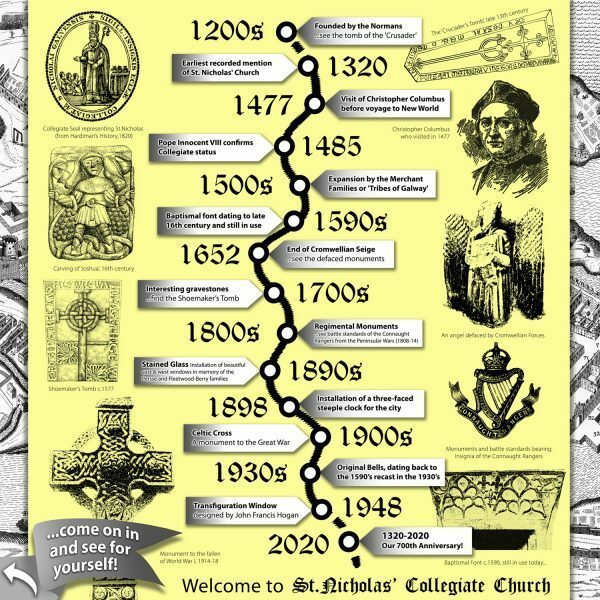 Choral worship in St Nicholas’ Collegiate Church has its origins in the college of singing clerks established to serve the medieval establishment. The church was constituted as a fully independent collegiate establishment in the late fifteenth century, and a college house built for the warden and vicars choral.